Young Grappas have a crystalline and absolutely transparent appearance. On the other hand, Grappas aged in wooden barrels take on hues ranging from light straw-colour to darker and amber shades, depending on the length of ageing and the quality of the wood used. 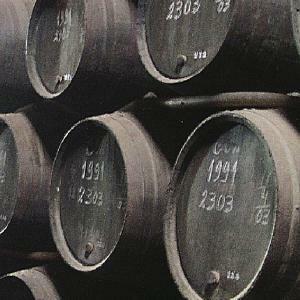 The types of wood most frequently used to make barrels are oak, ash and chestnut. Less widely used is cherry-wood, acacia and almond wood. Aged Grappas takes on different flavours depending on the characteristics of the wood the barrels are made from. When the distillate remains inside a barrel, significant chemical-physical interactions take place. In being porous, wood is not a hermetic wall separating the liquid from the external environment, and allows the distillate to transpire and therefore come into contact with oxygen, i.e. it oxidises. There will be different colours as well as different tastes, depending on how much the wood transpires. This oxidation is responsible for the increase in sourness in the distillate; an increase that will harmonise with other phenomena. Once put in barrels, all distillates have a strong power of extracting substances contained in the wood, such as lignin, which is one of the most important. Over time, this and many other substances offer unmistakable fragrances and aromas, recalling vanilla, tobacco and sweet spices, as well as intense and mature fragrances of cocoa, liquorice and cinnamon. When distillates are left to age in barrels, it is necessary to take into account that a part of them will inevitable evaporate into the surrounding atmosphere. The distillate passes through the pores in the wood, and becomes dispersed: each year 2-4% of the contents of every barrel evaporates, becoming what Cognac distillers call lapart des anges, or the angels' part. Grappas have a wide variety of fragrances and flavours as soon as they come out the still. When aged in wooden barrels, these fragrances and flavours become modified and enhanced. Therefore maximum attention must be paid during this stage, in order to create an harmony between the original freshness, given by the marc, and the maturity of fragrance that only wood can give.